paris | my heart is happiest when i travel. read. write. connect. Something I started a few years ago was reflecting on the past year through photos (you can click here to see my year in photos from 2016, 2015, and 2014). While I love telling my stories through words, there’s just something about a photo that can do it even better! Admittedly I take a lot of photos, so it takes me a while to sift through the virtual pile and narrow it down to the best ones. 2017 was a year of huge changes for me, both personally and professionally, and I am profoundly grateful to the people and experiences that marked this past year. This entry was posted in Slice of Life and tagged #sol18, bangkok, cruise, family, friends, indonesia, Jakarta, Japan, paris, photography, photos, Slice of Life, Slice of Life Challenge, Thailand, Travel on March 11, 2018 by aggiekesler. Today’s journey home, from Dakar, Senegal to Tirana, Albania, was a long one! We left at 1:00am Dakar time and flew to Paris, then to Rome, and then to Tirana. The whole trip was over 18 hours. But…what made the journey so much better was my layover at the Charles de Gaulle airport in Paris. No, it wasn’t long enough for us to go into Paris. I wish! What made it so special was that I got to catch up with a good friend of mine who I hadn’t seen since departing Shanghai this past summer. 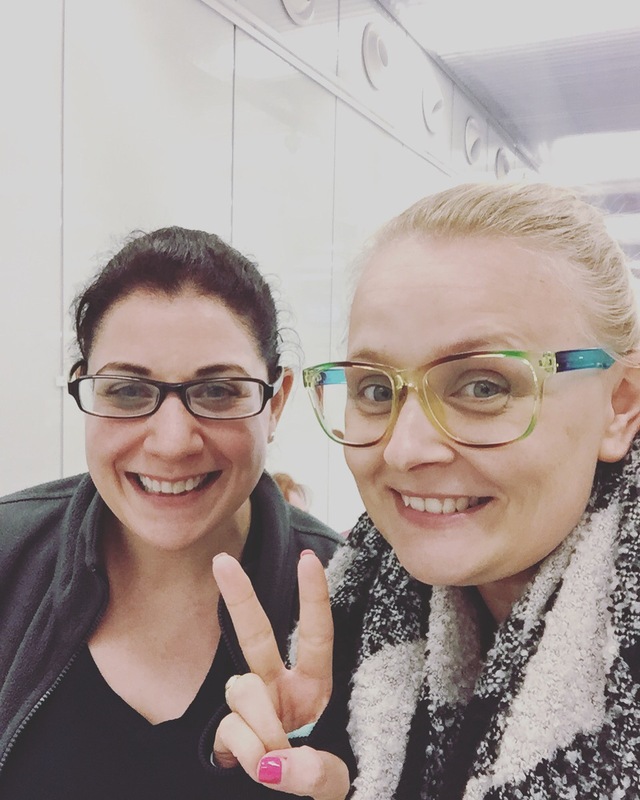 Heather was on her way to Mauritania to begin a 2.5 month substitute teaching position, and just so happened to land in Paris 15 minutes before I did in the same terminal. Now that’s a coincidence, huh? Well, naturally, once we figured this out, we made plans to meet up in the terminal before moving onto our connecting flights. After running into Heather, Sally and I made our obligatory Starbucks run. I had my usual Iced Chai Tea Latte and a blueberry muffin. She had a Java Chip Frappaccino. We had to go through security and customs, exit the terminal, and hike to another terminal, but when you are Starbucks-deprived, you’ll go to great lengths to get it! It was yummy! 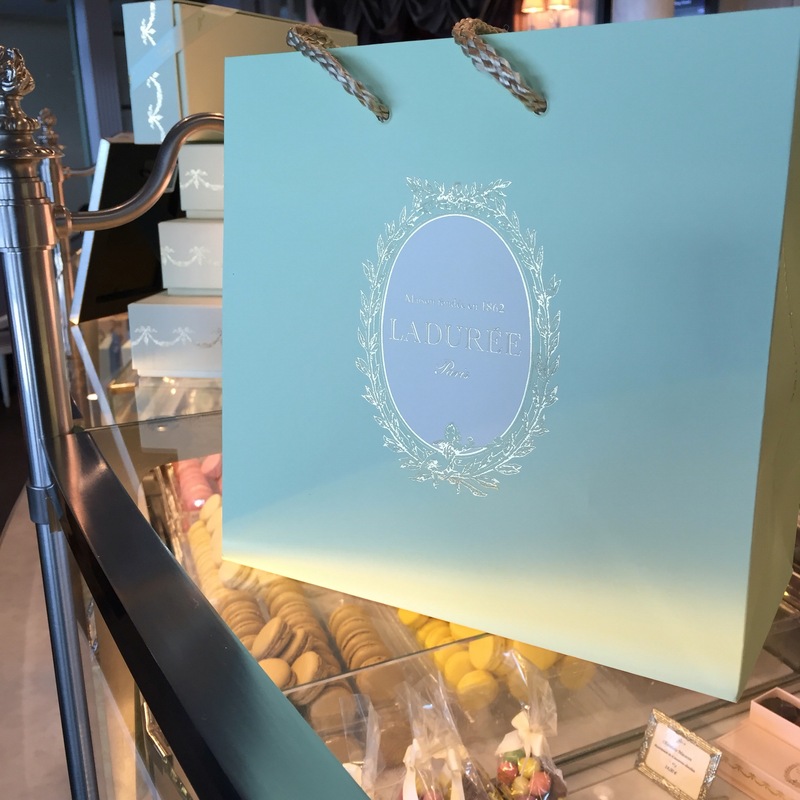 Our last stop before boarding was Laduree for some of the best macaroons in Paris. When in Paris, you must Laduree! Today’s flavors were salted caramel, raspberry, pistachio, praline, and chocolate passionfruit. The salted caramel and raspberry are my favorites, but the other flavors are new to me. I can’t wait to try them! If you’re ever in Paris (or even just the airport), do stop in and pick up a few. You won’t be sad you did! 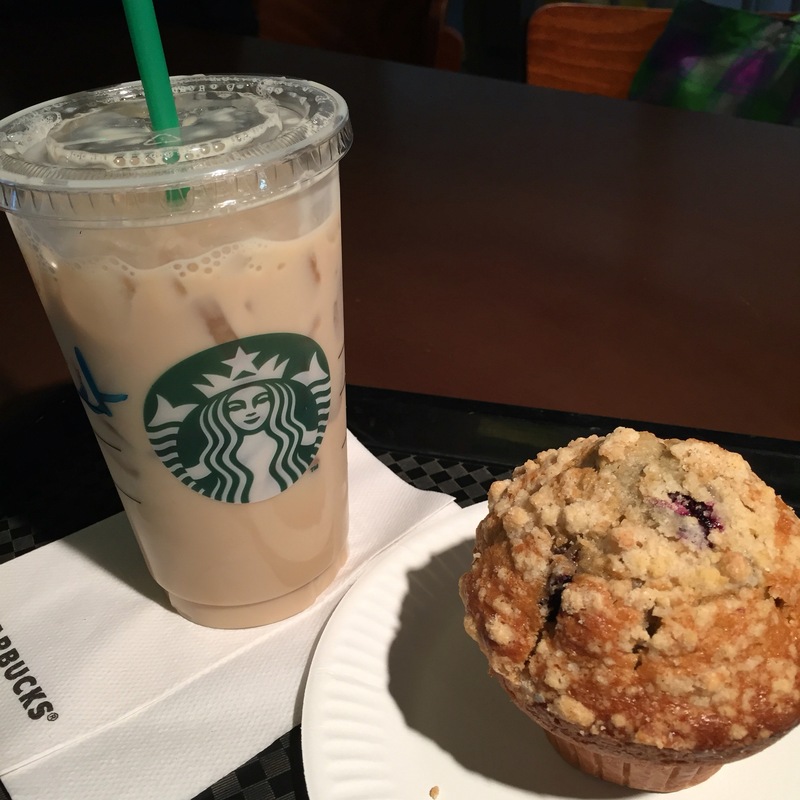 This entry was posted in Slice of Life, Travels and tagged #sol16, catching up, Charles de Gaulle, friends, Laduree, layover, living abroad, paris, Slice of Life, Starbucks, traveling on March 28, 2016 by aggiekesler. Ah, Paris…how I wish I was back there. Two weeks ago I traveled to Paris for the first time. Paris was one of those places that was always on my list, but was never really near the top. There’s too much hype. People build it up too much. I always thought it could never live up to its reputation. Plus I like going to places that are off the beaten track. Paris was just too mainstream for me. Seriously, everyone goes to Paris. Why would I want to go? Now that I live in Europe, Paris is close enough that I can take a trip for a long weekend. I know, even as I write that I realize how bratty I sound. Anyway…my friend Sally and I decided we’d go to Paris for our four-day holiday, which happened to fall on her birthday. Neither of us had been, so we figured, why not? I didn’t really research the trip much, and other than a visit to the Eiffel Tower and the Louvre and eating some croissants and macaroons, I hadn’t really planned much else. When I got to Paris, I realized why it’s hyped up as much as it is. It’s amazing, and deserves every bit of the attention it gets. Even the fact that it was really cold and rainy much of the time, I still fell in love with that city. How could I not? First of all, the architecture is stunning. No matter where you look, the detail cannot be missed. And the Louvre? Holy crap, that place is awe-inspiring! Not only because of the sheer size of the structure and volume of the collection, but the feeling one gets when walking through it is enough to take your breath away. Of course, a trip to Paris isn’t complete without a visit to the Eiffel Tower. It’s one of the most recognizable structures on Earth, and I’d be remiss not to see it up close and personal. On our first night, we were wandering around in search of a Starbucks (found one! ), and decided to stroll by the Seine River on the way back to our hotel. 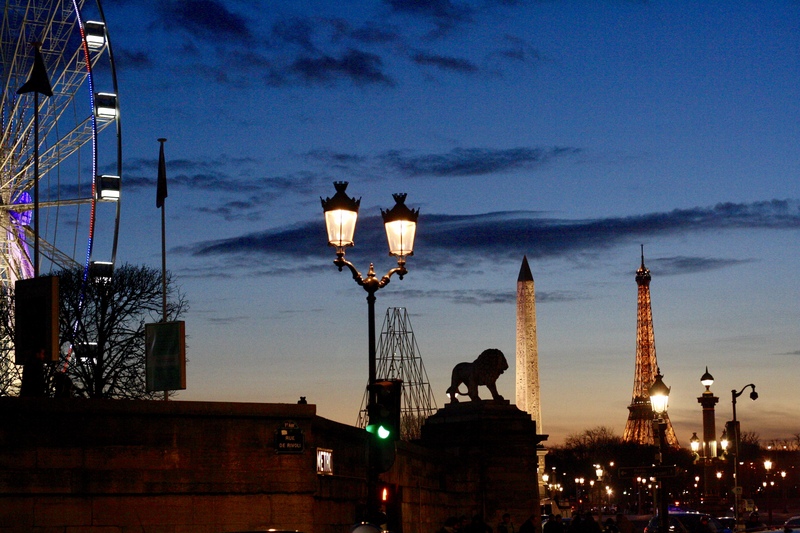 Once we reached the river, I saw the Eiffel Tower in the distance, lit up in a golden glow, beckoning me. I convinced Sally to take a walk and see it at night. Let me tell you something that you may not know. The Eiffel Tower is an optical illusion! It seems close, what with it being so big and all, but don’t let it fool you. Don’t think that you can walk to it quickly. Because you can’t. We walked for an hour, but it still looked the same. We walked for another hour. It still seemed out of reach. By this time my feet were killing me, but stubbornness in me refused to take a taxi. It was right there!! Anyhow, when we reached the base of the tower, all the pain was worth it. The Eiffel Tower, especially lit up at night, was one of the most beautiful things I have ever seen! I probably took a million pictures of it. I couldn’t get enough! And then there’s the food! Oh my gosh, this is a foodie’s paradise. Especially if you like decadent, indulgent, laden-with-so-much-butter-you’ll-clog-an-artery-but-every-bite-is-worth-it food. The food alone is enough reason for me to go back. In my opinion, you need to go for a week just so you have enough time to eat. That was my problem. I wanted to eat all the time, but because the food was so rich, I wasn’t always hungry. 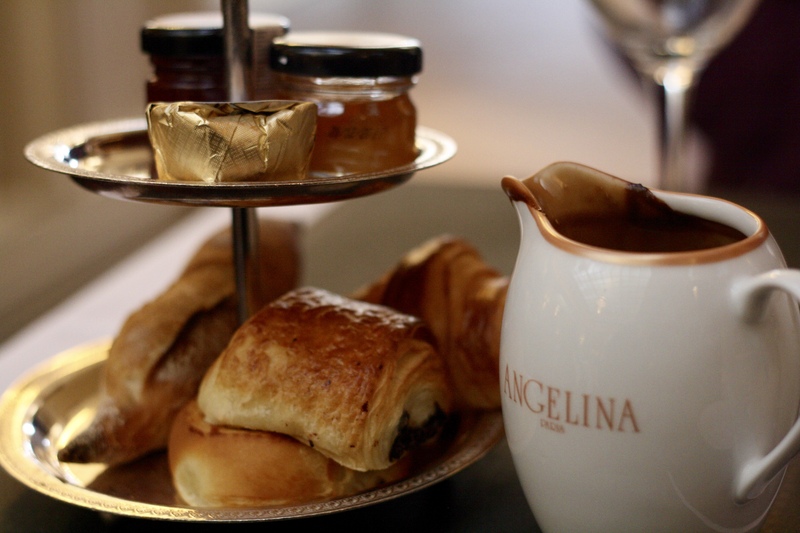 Some of my favorites were croissants and hot chocolate from Angelina’s, macaroons from Laduree, bread and butter from anywhere, cheese souffle from Le Souffle…the list goes on. Oh, and Paris has goat cheese! My life was complete. I intend to write more about Paris in the future, but suffice it to say, I loved it and will definitely be back! Here’s a short video of my time there…enjoy! This entry was posted in Slice of Life, Travels and tagged #sol16, adventure, france, goat cheese, paris, reflection, Slice of Life, traveling on March 5, 2016 by aggiekesler.